The state of Louisiana is often pictured through a common lens, one of eerie small towns, romanticized swamps, and a culture rooted in early French settlements. Louisiana, though, is a complex place with a history that runs much deeper than the stereotypes that haunt it. Today, there are visible influences of Native American, Spanish, French, English, German, Acadian, and African peoples. And this diversity continues to feed the art, architecture, food, music, and traditions that make Louisiana the distinct state that it is. Artist Lisa Qualls was born in Midland, Texas, but grew up in Baton Rouge, the state capital of Louisiana. She returned to Texas in high school but has found that she closely identifies with the culture of Louisiana. Visits have always been frequent, but in recent years, Qualls has felt a need to return for an extended period to make work—a self-propelled artist residency. Through her travels, Qualls sets out to represent the state both through its people and its landscape in what she dubs the Louisiana Portrait Project. She begins with photographs and interviews of persons she knows, individuals she researches and seeks out, and people she meets on walks about towns. If they mention a church or cemetery, she travels to those sites, documenting the area. The starting point becomes both the story and the individual telling it, allowing Qualls to create a body of work encapsulating the identity of Louisiana through the experience of encounter and exploration. Qualls has dedicated her entire artistic practice to the subject of cultural identity, consistently studying the environment, objects, and traditions that make up various communities. The Louisiana Portrait Project continues to embody this matter exhibited in Qualls’ previous work, in this instance bringing her personal association with her home state to light. For anyone interested in identity, it is seemingly impossible to investigate the endless ways in which people distinguish themselves around the world without at some point thinking of the issue within one's own surroundings. Interestingly though, Qualls turns the camera, recorder, and spotlight not on herself, but on the people of Louisiana. Qualls essentially chooses to find identity not simply in her own experiences, but in the culmination of personal stories and the history of place—a culmination that breaks down social constructs revealing a universal human experience. lisa qualls, near mer rouge in winter, 2015. carbon transfer, colored pencil, and acrlyic on paper mounted on panel, 9 x 12 inches. To make such considerable work, Qualls goes back and forth between depictions of the figurative and the landscape—landscape including interior spaces, such as bedroom scenes or collections of objects. The Louisiana Portrait Project allows her to continue along this trajectory as she sets out to capture both the people and the environment. For the first subseries of the project, Qualls takes the landscape and narrows the focus down to the importance of the state’s botanicals. Entitled A Collection of Silence, the series presents a rediscovery of azaleas, camellias, irises, and magnolias—plants that undoubtedly speak to the identity of Louisiana. These particular flowers are often thought to be pure representations of the area, though they are mostly transplants that originated in Asia, arriving in Louisiana by way of Europe. Typical of Qualls’ practice, the ancestries of these plants are extremely significant in tying the botanical subject matter to that of the Louisiana Portrait Project as a whole. lisa qualls, dusk, 2015. photograph on watercolor paper, 25 x 30 inches. 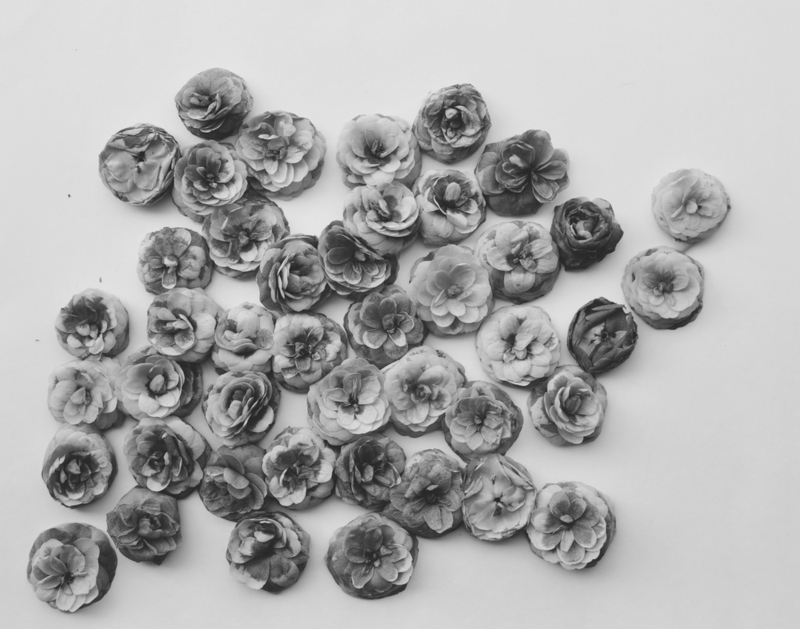 lisa qualls, camellia debris (study for a drawing), 2015. Photograph on watercolor paper, 21 x 30 inches. The study of the very basic history of Louisiana reveals extraordinarily similar language in the history of Native Americans, French and Spanish settlers, the migration of the Acadians, the arrival of Africans through slavery—and the impending blending of cultures, families, and traditions over centuries of constant newcomers. This complex layering of people over centuries is present in the mind of Qualls as she makes work, so much so that it is experienced through the botanicals she comes across on her travels. Stylistically, Qualls approaches the subject differently than the traditional bouquets of botanical still life. In her drawings, paintings, and photographs, the artist uses loose individual flower heads against stark white backdrops, playing with the visual influence of her careful composition and the surprising impact of negative space. The showcase work in A Collection of Silence is entitled Moon Gate, roughly 30 drawings on canary paper layered to make up an entire installation. The bottom is lined with irises. As one's eye travels, camellias and magnolias fill the left-hand side, highlighting the intensity of the heavy graphite lines of the thoughtfully arranged flowers, versus the areas left purposefully vacant. The layers, which in some places include three or four drawings on top of each other, provide a hauntingly translucent view of the flowers, the ghosts of gardens past. lisa qualls, moon gate (detail), 2015. graphite and tape on canary paper, 96 x 108 inches. Moon Gate is a precursor to the work Variorum II, an entire room made up of the same layered canary paper drawings, but where a viewer can actually enter, sit, and be completely engulfed in the setting. Variorum—meaning different versions or notes by various editors, scholars, or critics—is apt in this instance, as the layers of drawings refer to plants both native and imported, and worked over centuries by generations of Louisiana gardeners. While Qualls uses the term Variorum explicitly, Moon Gate is less of a reference to the name given to Chinese garden entrances—though fitting as well seeing as the botanicals mostly originated in Asia—and is more a call to the artist collecting the flowers under moonlight in the evenings or early mornings. Additional drawings, paintings, and photographs within A Collection of Silence continue to explore the extravagance of the Louisiana flower through highly detailed yet muted compositions of the botanical still life. In the drawings Camellia Debris from Biedenharn Garden and Camellia Debris from Trenton Street, Qualls not only makes a point to give us a location in the title, rooting us in place, but also emphasizes a name and composition that brings to mind beautiful remains, a representation invoking centuries of historical influence still prominent in Louisiana culture. In the painting Gleaning from a Ouachita River Garden, Qualls incorporates color to highlight the various stages of decay occurring as the camellia changes from bright pink to glowing shades of brown. These depictions call to Qualls’ predecessors of the 17th century Dutch still life, who purposefully incorporated flowers in various states of decay as a symbol of mortality. Lisa qualls, gleaning from ouachita river garden, 2015. oil on paper, 25 x 32 inches. His panels of floating botanicals are of clear influence when seeing the similarities in the way Qualls lays out her scenes. And while perhaps the most obvious difference between the two artists seems to be Redon’s bright colors created by pastels versus Qualls’ subtle tones created by graphite, Redon credits much of his work to the use of chiaroscuro. Qualls celebrates the historic technique in almost every work she creates as she continuously utilizes strong contrasts between light and dark areas of her compositions. Redon’s work in botanicals, often classified as decorative, can certainly be celebrated for its sheer beauty—though like most still life, it rarely holds a purely decorative purpose. In the instance of Qualls and her work in A Collection of Silence, there is an undeniable depth as she situates the series not on its own but within the greater investigation of the Louisiana Portrait Project. While the subseries A Collection of Silence is primarily made up of two-dimensional works an important piece tying the group of objects together is the sound installation Near Silence. With no visual but an ottoman inviting the viewer to rest, Qualls composes a series of recordings from her travels, capturing birds and insects that made themselves known along the bayous and rivers she visited. This collection of near silence not only takes us directly to the environment being depicted through flowers, but it also considers the role sound plays in conditioning a person’s sense of place and how that may be interrupted. This and the works that make up A Collection of Silence bring the viewer directly into Qualls’ experience through immersive representations of Louisiana botanicals. As Qualls moves forward with the overall Louisiana Portrait Project, additional works exploring the people and landscapes of the state will continue to develop the conversation Qualls has only just started. That conversation continues to be one of cultural identity. While Qualls is returning to her home state, she seems uncomfortable focusing on herself. She consciously chooses instead to investigate other people within the place she feels is most familiar to her. For this particular subseries especially, Qualls is more comfortable exploring the cultural identity of a botanical species within that very landscape than directly exploring her personal associations. But these efforts in taking in her surroundings will undoubtedly result in the introspection she is perhaps really seeking, surfacing with the idea that one’s identity is more appropriately discovered when learning and documenting others—relating to their story, rather than forcing someone else’s story into what is familiar to one's self. As Qualls travels from parish to parish, dedicated to an all-encompassing representation of an extensively diverse state, she continues to think about individual and place, eventually shifting a seemingly focused project into a discovery of universal human experience. Exhibition Lisa Qualls: A Collection of Silence is on view at French & Michigan Gallery through October 31, 2015. This curatorial essay is included in the corresponding catalogue for the presentation, alongside two additional essays and an interview with the artist. Catalogue available for purchase below. For inquiries or questions, email gallery@frenchandmichigan.com. Margaret Tapley, Growing Camellias (London: Cassell, 1996), 7. Marius-Ary Leblond, “Odilon Redon: The Marvellous in Painting,” La Revue illustrée, 20 February 1907, no. 5.